There’s even more craft beer coming to Downtown later this year, as First Draft Taproom & Kitchen plots to take over some mixed-use space in South Park this fall. The 4,000 square foot property lands inside the WREN, a coming seven-story development dropping onto Olive Street starting this spring. First Draft follows a typical type of beer bar, wherein guests can pour their own drinks from a proprietary draft system. It seems, based on the below image, that they may rely on the same iPourIt system as Brewport Tap House in El Segundo. That allows guests to not only choose from something like 70 taps total, but also control the drink size down to the ounce, paying with a wristband loaded with prepaid credits. Much like nearby Karl Strauss, there will also be a menu of simple favorites from sandwiches and salads to small shared plates. The original Denver version of First Draft also offers taps for coffee, cocktails, and kombucha. The fall debut of First Draft Taproom should coincide with a number of other recent and soon-to-arrive craft beer-focused openings in the neighborhood, including Mikkeller Bar on Olympic. Add to that Modern Times Beer, which is still set on South Park — plus new drinks-focused dinner options like Prank Bar — and it’s suddenly a crowded booze market in that stretch of the city. 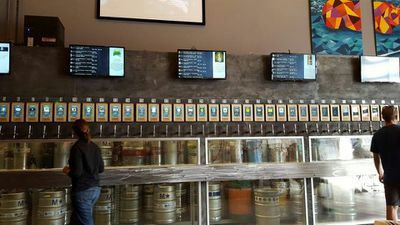 “Denver DIY Beer Bar First Draft Taproom Lets Downtowners Pour Their Own Pint.” Eater LA – All. http://la.eater.com/2017/3/23/15042596/first-draft-taproom-downtown-south-park-craft-beer.